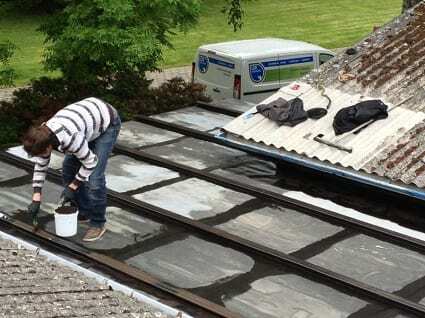 The flat zinc metal roof connecting two sides of this Primary School in Belgium had been leaking and multiple attempts at repairing it had been made. 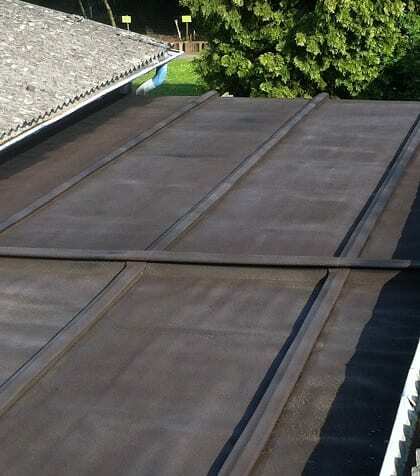 The zinc metal roof connecting two buildings of a Primary School in Neeroeteren had become a problem with extensive leaks into the room below. The sloped zinc roofs on the buildings on either side drained right onto this flat roof section where it would leak in along the base flashings. Multiple repair attempts had been made with mastic and other metal roof repair products. The school was tired of the constant maintenance of repairing this roof and went looking for options for a long-term solution. The first option was to tear-off the roof and replace it with a brand new system. This would be costly, disruptive, and could lead to continued leak issues at the areas where the roof connects to the neighboring buildings. Most liquid systems cannot withstand the movements of a zinc roof panels. TM Technics recommended the entire zinc roof be retrofitted and restored with the seamless TRITOflex liquid rubber system which is spray applied to any thickness in one coat. With 1900% elongation, TRITOflex is able to withstand the underlying movements and changes of the zinc roof and also provide extreme flexible water resistance along the base flashings. In addition to that, TRITOflex’s impermeability will prevent future rust and corrosion of the zinc roof panels as a true vapor and air barrier. With FM-approved UV stability and resistance, the school would be able to rest assured the TRITOflex seamless protection will keep their building leak-free. TRITOflex was spray-applied to a 1.5 mm (60 mils) dry membrane thickness in one coat by CDR Solutions, a Certified Triton Applicator in Belgium, after the surfaced was primed and prepared with TRITOprime and TRITOtrowel liquid rubber. The school received a fully warrantied roof system that will provide extreme protection from all of the elements and they were able to avoid tearing off and replacing the existing zinc roof.